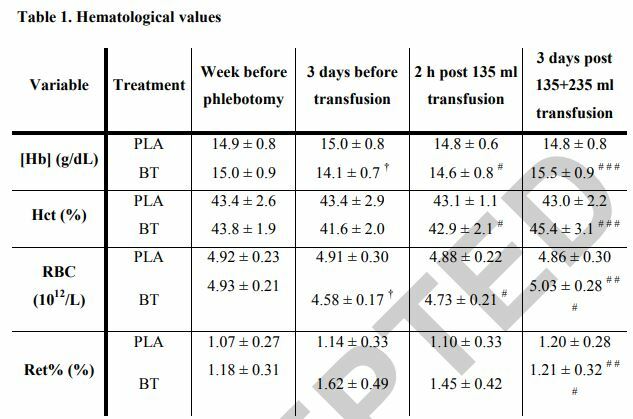 The first thing to notice is that TT performance was not better in the low-volume transfusion condition, it was the same as placebo (223 vs 224). And note that the baseline for the transfusion condition is lower than placebo (213 vs 223). The baselines should not be different as this is a cross-over design study so its the same subjects going through both conditions. Check out the retic prior to the transfusion 1.62, still well up from the control values (1.07, 1.18, 1.14) so the body is still churning away making new RBCs to try to correct the anemia. Sure enough the direct measure of Hb mass is still down by 5% (45 gm) just prior to the low volume transfusion (or down 35 gm compared to placebo condition), which correlates well the baseline TT being down by 5%. What the authors therefore found is that 5% ANEMIA results in a 5% decrement in TT performance. Makes sense. So my question here is this: Did the authors actually get the participants to a super-physiologic state with their low-volume transfusion? The Hg concentration of the withdrawn blood was 150 gm/L and they took out 900 ml = 135 gm. They transfused back in 1/4 of that = 34 gm. So a low-volume blood transfusion “doping” study never actually dopes the subjects but only just gets them back to normal physiology. The problem with that, (besides my grammar here) is that the effect of correcting anemia may not represent what happens when the Hg mass is raised to a super-physiologic level. It does make sense that there will be some benefit but it also makes sense that there will be some saturation of potential benefit going super-physiologic vs correcting anemia. Likewise, these “highly-trained men” are only putting out 220 watts for about 40 min. It makes sense that the benefit that a true elite athlete might saturate some vs these (sub-cat 4/5) participants. How much benefit a half-unit transfusion would give out in the real world is a question not really addressed by this study. Maybe it indicates a ceiling to the effect around 5% or less.